Load Indicator System - Scale and Control Inc. Scale and Control Inc. offers the Rayco-Wylie i4000 Load Indicator system, which calculates load through a load sensing device installed in line to the crane rigging or under the hook. This system allows for load/angle/length/radius configuration rather than a digital load chart programmed, which some prefer so that operators manually read the load chart to inform decisions. 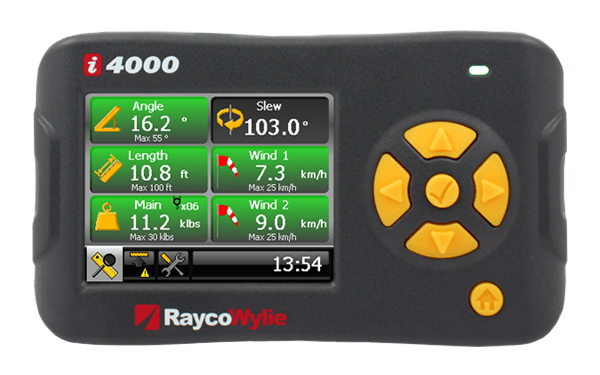 The i4000 Display can also monitor A2B (Anti-Two-Block) and windspeed sensors. View details below, download our brochures, and contact us for info and pricing today! This is the simplest form of load monitoring. Here, a strain gauge device is used to read the wire rope tension producing a load value. The load sensing device can be installed in line to the crane rigging or can be placed under hook. Users can also choose an LALR configuration. Load, Angle, Length, Radius configurations do not have the digital load chart programmed into the display. Many old school fleet managers and owners like this configuration as it forces the operator to manually read the load chart to ensure what they can safely pick. OSHA mandates as a minimum that a load indicator be installed on new cranes over 3-ton capacity. Moreover, you see an LMI or RCI coming as standard on new factory cranes.